Between 1950 and 2000, the United States became a nation of snackers. Manufacturers introduced a host of packaged snacks that catered to basic cravings for sugar, salt, and fat. By the 1980s, people were consuming snacks everywhere—at home, work, and school, and while in the car or walking down the sidewalk. Yet as these items became widely accessible and affordable, many questioned whether they were contributing to the loss of healthy eating patterns and the overconsumption of foods with little nutritional value. Since the first Super Bowl football game in 1967, the annual championship contest has become a national day of snacking. For many Americans watching at home on television, the game has become secondary to the feasting. Game-day favorites include pizza, chicken wings, chips, nuts, popcorn, dips, spreads, and beer. Flo and Skip Ford have hosted Super Bowl parties for friends and neighbors since 1997. Chili, taco dip, and crab dip are their perennial favorites. Gift of Flo and Skip Ford. 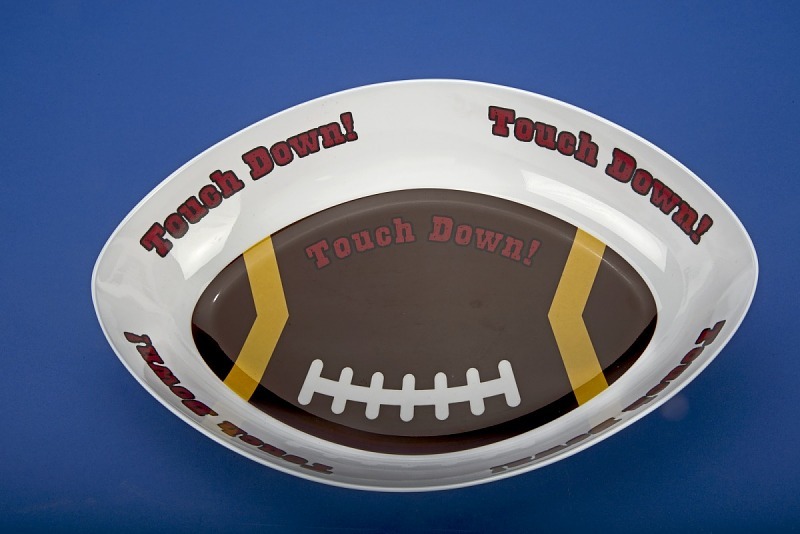 The average American consumes an extra 1,200 calories on Super Bowl Sunday. Creative game-watchers have built “snack stadiums” with a variety of sweet and savory snack foods as raw materials. When the Dallas Cowboys defeated the Buffalo Bills in 1993, Texas Senator Phil Gramm received Buffalo chicken wings from New York Senator Alfonse D'Amato. Most Super Bowl bets between politicians involve regional foods. Buffalo wings were created in 1964 and have become a Super Bowl standard.